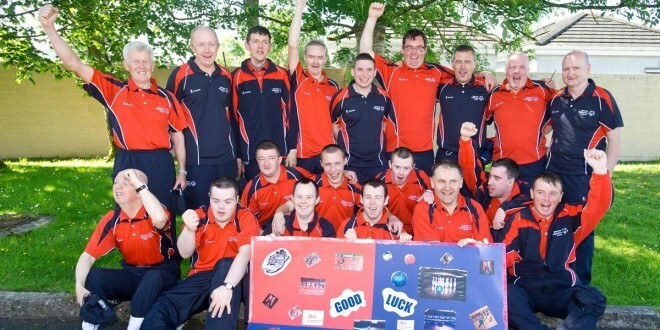 The Brothers of Charity Special Olympics team and mentors, who represented Munster at the national finals in Limerick. Photograph by John Kelly. There was great success for Clare athletes at the Special Olympics National competitions in Limerick. Robbie McNamara won gold in the 200m and bronze in the 1200m, while he was a member of the 4 x 100m relay team which took sixth spot. In Division 2 soccer, Stephen McInerney and Patrick Spellissey won gold medals while in Division 3 soccer, Barry O’Regan, John Fitzgerald and Stefan Davis were gold medal winners. In Division 4 soccer, Kieran Whelan, Sean O’Neill and John Madden won silver medals. In basketball Division 2, Martin Cusack and Declan Clohessy were silver medal winners. Adrian O’Neill won a gold medal in the table tennis singles competition and he also won gold in the doubles competition. Patrick O’Leary also won gold in the doubles, while he was fifth in the singles. All of these athletes are members of the Brothers of Charity in Ennis. There was great excitement at the Gort Road headquarters of the organisation as their Special Olympics Munster squad members assembled to depart for the University of Limerick for the Games last week. There to wish them all the best of luck were colleagues, friends, relatives and staff, who gave them a royal send off. The Games only take place every four years and this year, 1,500 athletes, with the support of 500 coaches and 3,000 volunteers, who all went through a special training programme, were striving to make these the best Games yet. The Ennis group, made up of 14 athletes and five coaches, represented Munster in five sports, soccer, table tennis, basketball, athletics and golf. Whilst the headquarters were in the University, some of the sports took place in other locations, with the bowling competition at Clare Leisure World on the Showgrounds Road in Ennis.